Settings for these 9" dolls with bendable bodies, delicately etched faces, and charming accessories, as well as small books that relate to typical problems of girlhood. The two sided Ballet Studio Theatre ($50) has a mirror and bar for doll to go through her paces. On the other side is a theatre with curtain where she can perform for an audience of other dolls. Very cute. 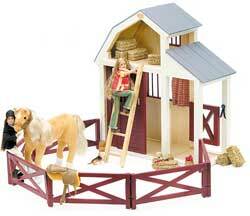 For young horse lovers, this is a beautifully crafted Stable($75) With stables and tools for grooming horses( included) As for the dolls, girls need considerable dexterity to get the little shoes and clothing on and off. Unlike most fashion dolls today, these have outfits that would be acceptable to well-heeled parents and grandparents. They are dressed like girls-not funky streetwalkers in training. 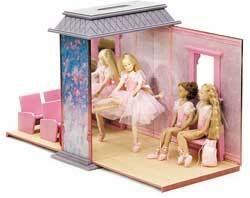 Our testers were thrilled with the Ballet Studio Theater, Stable ($75 ) and dolls.